Adapt-N is an on-line tool for precision nitrogen management in corn (grain, silage, sweet), which has been available to growers in the Northeast and five Midwestern states for the past two years. It is a computational tool based on the concept that seasonal corn N needs can be estimated much more accurately in the late spring when factoring in weather, soil and management information. The main question for growers and other stakeholders is whether the tool provides recommendations that increase profits and reduce environmental impacts. We are answering those questions through on-farm strip trials. The 2011 results were reported by Moebius-Clune et al. (What’s Cropping Up? Vol. 22, No. 2, 2012) and showed very encouraging results. We are discussing the 2012 strip trial results in this article, and a summary article for all site-years is also included in this volume. Adapt-N (http://adapt-n.cals.cornell.edu) uses a well-calibrated computer model, and combines user information on soil and crop management with high-resolution weather information, to provide N sidedress recommendations and other simulation results on nitrogen gains and losses. As a result of 2011 beta-testing, several improvements to Adapt-N were implemented for the 2012 growing season, including adjusted soil type, previous crop, manure and irrigation input options. Model routines for soybean N contributions were adjusted to avoid artificially low N recommendations that had occurred in 2011 and an uncertainty-adjusted price-ratio correction factor to optimize profits from N application was also incorporated into the Adapt-N tool. This factor takes into account several key realities that affect farmer profit: 1) the prices of fertilizer and grain, 2) the variable risks associated with over- and under-fertilizing, and 3) the reduced uncertainty in the optimum N rate with use of this precision tool. Using a fertilizer to grain price ratio of 0.1 ($0.60/lb N: $6 bu grain) Adapt-N subtracted 8 lb N/ac from the model-predicted Agronomic Optimum N Rate (AONR) to determine the Economic Optimun N Rate (EONR). On-Farm Strip Trials. We completed 42 replicated strip trials on commercial and research farms throughout New York and 19 replicated strip trials in Iowa (1 trial in Minnesota, included with the “Iowa trials”) on commercial farms during the 2012 growing season. The trials involved grain and silage corn, with and without manure application, and different rotations (corn after corn, corn after soybean or other; Table 1). Sidedress treatments involved at least two rates of nitrogen, a conventional “Grower-N” rate based on current grower practice and an “Adapt-N” recommended rate, based on a simulation run just prior to sidedressing. In 2012 NY trials, all but three Adapt-N rates were lower than conventional N rates (by 20 to 138 lbs/ac; Table 1). In 2012 Iowa trials, all but two Adapt-N rates were lower than the conventional N rates (by 20 to 100 lbs/ac; Table 1). Growers in IA and NY implemented field-scale strips with 2-7 (usually 4) replications per treatment. Yields were used as measured, regardless of statistical significance, since the statistical power to detect treatment effects is inherently low for two-treatment strip trials, but averaging across large numbers of trials provides good statistical power for assessing Adapt-N performance. For corn, a 2012 grain price of $6.00/bu was assumed ($7.00/bu minus $1.00/bu for drying, storing and trucking from PA Custom Rates; USDA, 2012). For silage, $50/T was used based on reported NY silage prices of $25-75/T. A nitrogen fertilizer price of $0.60/lb N was used (reported prices ranged from $0.42 – $0.80/lb N in NY and IA). When Adapt-N recommended no need for sidedressing and the Grower-N rate was greater than 0 lbs/ac, sidedress operational savings of $8/ac were added to the profit. If Adapt-N recommended an application of N and the Grower-N rate was 0 lbs/ac N, a loss of $8/ac was subtracted from the profit. Agronomic and economic outcomes of these trials were used to assess Adapt-N performance. Agronomic and economic comparisons between Grower-N and Adapt-N treatments for each trial are provided for NY and IA trials in Table 1 and Figure 1, and as averages in Table 2. NY corn after corn trials (Figure 1 a-c). 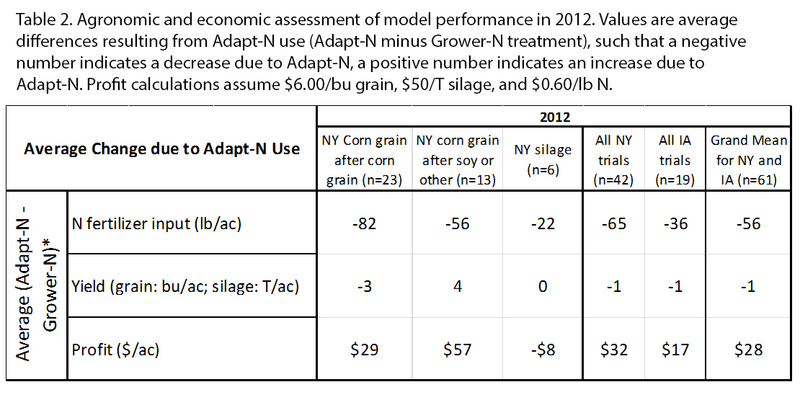 Adapt-N rates in all of the NY grain after grain trials resulted in N input reductions of 82 lb N/ac on average. In all but one trial, no significant yield loss was measured with these reduced N rates. Adapt-N rates provided a profit advantage over conventional N rates in almost all trials (by $1.62 to $88.20/acre). In 4 of the 5 instances where Adapt-N rates resulted in profit losses, actual yield achieved with the higher N rate exceeded the expected yield used in the Adapt-N simulation (by 9 bu/ac to 35 bu/ac) to estimate the sidedress rate. In each of these four cases, a more appropriate expected yield would have been available from existing yield records, and would have likely resulted in a sufficient recommendation from Adapt-N.
NY corn after soybean or other crops (Figure 1 d-f). Adapt-N rates in all NY corn grain after soybean trials (or after other crops such as wheat, oats, silage) consistently resulted in profit increases (of $7.64 to $105.30/acre). These results demonstrate that the soybean N crediting method used for 2012 successfully corrected the 2011 error. Harvest data show that, despite large N input reductions in Adapt-N treatments (average 56 lbs/ac), reductions in yields were negligible in all trials and only statistically significant in one case (Trial 34). In the only trial where Adapt-N recommended a higher rate (by 23.5 lbs/ac, Trial 22), yield increased by 6 bu/ac and a profit was realized despite higher fertilizer cost. NY silage (Figure 1 g-i). Adapt-N rates in 4 of 6 NY silage trials resulted in N input reductions (22.5 – 50 lbs/ac). No statistically significant yield loss with these reduced N rates was found (average 0 T/ac difference when N rates were decreased). Adapt-N rates provided a measured profit advantage over conventional N rates in two of these trials (by $48 and $58/acre) when N rates were reduced by 50 lbs/ac. Profit losses in the other four cases were due to field variability, underestimated yield potential, small N rate differences, and/or drought. Two of these trials (17 and 18) registered a profit loss due to small yield losses because yields were higher than the ‘expected yield’ entered into Adapt-N, in addition to artificially low Grower-N rates as the grower was already reducing N rates to near Adapt-N rates (55-75 lb/ac below standard recommendations that use current yield potentials). In comparison to standard recommendations, these trials would constitute profit gains with Adapt-N use. In two trials, Adapt-N rates were higher by 10-11 lbs/ac, justified by the expected yield input of 22 and 24 T/ac respectively (Trials 14 and 15). Due to drought, measured yields were well below expected yields (by 5.3 and 11.8 tons), and due to field variability, measured yields were lower in plots with the higher Adapt-N rate, resulting in a calculated profit loss. Silage trials were less numerous, and exhibited greater yield variability than non-manured grain trials, making it more difficult to assess Adapt-N performance. Factors contributing to such variability are low precision in manure testing and application (in comparison to synthetic fertilizer), unevenness of spreading, and the effects of drought in several trial locations. An overall assessment of the currently available data in silage trials for 2011 and 2012 (Moebius-Clune et al. 2013a) suggests that the model is handling these well, and that profit gains are achieved particularly with large N use reductions at sidedress, but further testing is desirable. IA corn grain trials (Figure 1 j-l). The majority of 2012 Iowa trial results were impacted by abnormally droughty conditions. Still, Adapt-N rates in all but two of the 19 IA trials resulted in N input reductions (by 36 lb/ac on average). Except for one trial, no significant yield loss was measured with these reduced N rates. Adapt-N rates provided a profit advantage over conventional N rates in 74% of the trials (by $1.49 to $81.20/acre). In one of the three trials where N reductions resulted in profit losses, actual yield achieved with the higher N rate exceeded expected yield used in Adapt-N by 9 bu/ac (Trial 62), resulting in a profit loss despite N savings. In the 2 trials (65 and 73) where Adapt-N recommended a higher rate than the conventional N rate (by 30 lb/ac and 40 lb/ac respectively; the latter was accidentally implemented as 70 lb/ac), the expected yield was not attained due to mid-season drought, resulting in profit losses from unnecessary N application. Our 2012 Adapt-N trials affirm our 2011 conclusions: The value of the Adapt-N tool is substantial, resulting in significant N input and loss reductions and in profit savings in 77% of all trials (Table 2, Figure 2). Of the 2012 recommendation errors, half (7 trials) were preventable with better expected yield inputs, and only 5% were unexplained. Recommendation errors in 2012 resulting in profit losses mostly occurred in instances where expected yield either exceeded or underestimated actual yield, thereby demonstrating the importance of a good estimate of the expected yield in generating accurate N recommendations using Adapt-N. Drought conditions during the growing season resulted in abnormally low yields in several trials. Obviously, Adapt-N or other N recommendation methods are unable to account for abnormal weather events that occur after the window for sidedressing has passed. The tool was, however, successful in adjusting for the significant effects of early season conditions to recommend N fertilizer needs more precisely. Grower profits increased on average by $32/ac in NY, and by $17/acre in IA trials with the improved 2012 model version. N application rates were significantly reduced in almost all cases, by 54 lbs N/ac on average, and thus post-growing season losses of excess N to the environment were decreased substantially. Higher N recommendations were justified by higher yields when drought was not the greater limiting factor. 77% of Adapt-N recommendations provided increased grower profits over current rates in 2012, when including inadequate expected yield inputs, 87% when these are excluded. Model inputs, especially yield expectation, must be carefully chosen to represent field-specific conditions. In all, growers can realize large savings with the use of Adapt-N, which also provides strong incentives to shift the bulk of N applications to sidedress time, and will in the long term decrease environmental losses. For more information: The Adapt-N tool and training materials are accessible through any device with internet access (desktop, laptop, smartphone, tablet) at http://adapt-n.cals.cornell.edu/. Information on account setup and the recorded 3/21/2013 in-depth training webinar are posted there. Adapt-N users can elect to receive email and/or cell phone alerts providing daily updates on N recommendations and soil N and water status for each field location in Adapt-N.
Moebius-Clune, B., M. Carlson, H. van Es, and J. Melkonian. 2013a. Adapt-N Proves Economic and Environmental Benefits in Two Years of Strip-Trial Testing in New York and Iowa. What’s Cropping Up? Preview. Moebius-Clune, B., M. Carlson, D. Moebius-Clune, H. van Es, and J. Melkonian. 2013b. Case Study – Part II: Donald & Sons Farm Implements Adapt-N Rates on Whole Farm, Saves Money and Environment. What’s Cropping Up? TBD. Moebius-Clune, B., H. van Es, and J. Melkonian. 2012. Adapt-N Increased Grower Profits and Decreased Environmental N Losses in 2011 Strip Trials. What’s Cropping Up? 22. [URL verified 4/27/13].